Students in ENAE100 the Aerospace Engineering Profession competed in their year end poster session on December 11th in the rotunda of the Jeong H. Kim Engineering building. Students work in groups and select a project topic recommended by aerospace faculty. 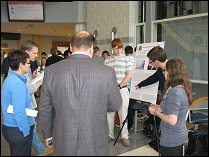 Students complete the project with the help of their faculty adviser and/or a graduate student mentor and are required to present a poster explaining the findings of their project to faculty judges. The event photo album can be viewed on the department?s Facebook page.